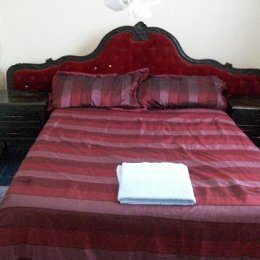 Margpher Guest House is elegantly and tastefully furnished with seven spacious and comfortable bedrooms. All our rooms come en-suite, are newly decorated, have comfortable mattresses, lockable rooms, mosquitoe nets and a lounge. The bathrooms have instant hot showers and come with a complete range of toiletries, hairdryers, and irons. Margpher Guest House is situated in Karen, one of the posh leafy suburbs of Kenya's capital, Nairobi. It is a place most guests consider home away from home: a quiet area with tranquil setting you rarely find in most high-end hotels. The guest house has a large yard with lots of trees, flowers and deck chairs where one can sit, relax and enjoy the sun, bird watch, or simply enjoy the view. It is a 5 minute drive from the Karen Shopping Centre, 15 minutes from Nairobi City Centre, and 25 minutes from Jomo Kenyatta International Airport. Surrounded by more than two and a half acres of beautifully landscaped gardens featuring carnations, hydrangeas, bougainvilleas, and roses in addition to a beautiful sanctuary of trees where one can relax, read a book on the garden chairs. The property is also a birdwatcher's paradise where a wide variety of beautiful and exotic birds can be found all year round. The dining experience at Margpher Guest House is one of a kind. The on-site cooks are professionally trained and are able to prepare a variety of dishes. Meals can be served on different areas within the property including the dining room, the lawn, or at the patio to create the most unique dining experiences. There are lots of restaurants nearby where one can enjoy a variety of local as well as international cuisines including the famous Carnivore Restaurant.